The two scamper off, the young red head and the old red head, hand in hand, to take the trail to Sotcher Lake, but return a few hours later empty handed–no one was catching fish this morning, even the guys on the inflatable rafts. With some of my homemade blueberry corn pancakes in our bellies, we’re off to hike to Minaret Falls and do some fishing along the Middle Fork of the San Joaquin River. Since we’re getting such a late start, and we have a small boy, we take the shuttle to the Devils Postpile NPS Ranger Station to cut off about 1 mile from our proposed 3 mile round trip hike. From the Ranger Station, we hike southwest a bit, then cross the river on a bridge. We climb a bit on well made, well signed trail of pumice gravel and decomposed granite under ample pine tree shade. Within no time, we’ve scrambled off the trail to the base fo the falls, and the boy has his feet in the cool water. We put his red Teva river shoes for a better grip on the slippery rocks, and soon he’s wet and happy. According to one source, the falls cascade some 250 feet in a series of white water, while another source says 300 feet or 90 meters; they seem as broad as they are long. The noise makes you shout to be overheard. As glorious as they may be, we don’t stay long in the cool spray and environs–the Big Monkey has fish fever, so we head down stream toward the confluence with the San Joaquin river. Just upstream, we find a nice hole where the fish are jumping like crazy and we watch, somewhat agog, as they flip, flop and fly after the bugs! The boy, bored more quickly than Dad, finds a tunnel like trail through the willows which is too fun to pass up, so I go with him. 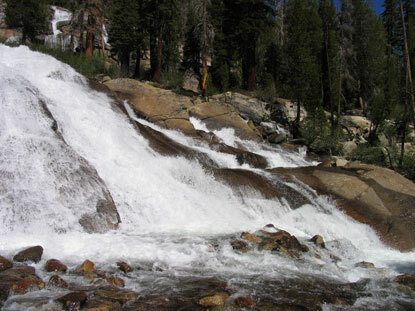 The trail comes out at Minaret Falls campground–18 roomy spaces, gorgeous views, flush toilets, potable water, and great fishing within a few minutes walk. A rumble of thunder gets a glance skyward–it looks and sounds like a big storm is coming so we scramble our way through the willows back to the Big Monkey who had noticed little in our absence except the constant flash of fish…fish getting away. So far none for dinner. I convince him we should catch the shuttle back to camp before we get drenched since we neglected to bring rain gear and the boy has already soaked his way through his clothes. Since all the campgrounds are strung between the road and the river, we walk down the road toward the Minaret Falls campground shuttle stop. It’s quite a walk, and when I look at the map realize that there’s a trail along the creek which leaves one end of this campground and arrives quickly at the other end of the Devils Postpile shuttle stop. But we’re already at the road waiting. Next time!